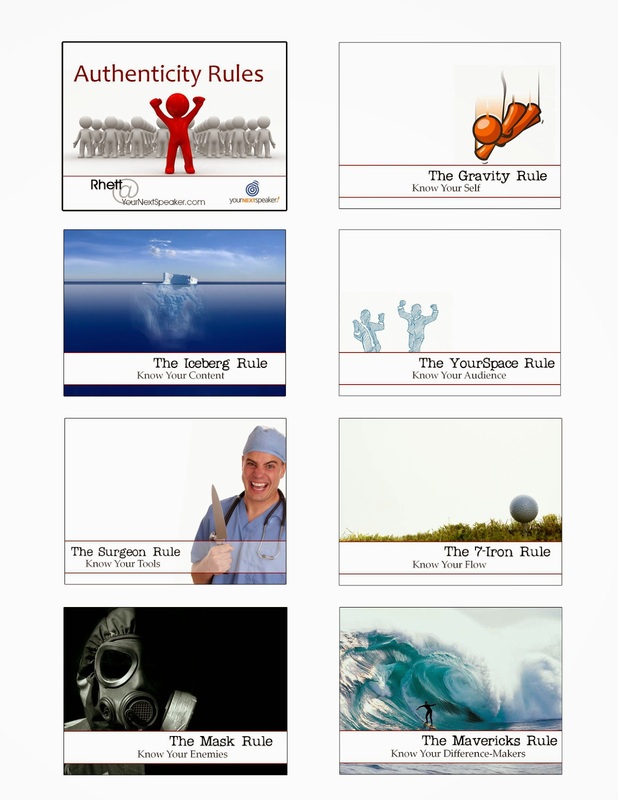 The Authenticity Rules are seven basic rules that are insights into the shared knowledge areas of highly effective presenters. These rules and one basic tip in each area are listed below. Gravity always exists. You can only overcome it temporarily. You must know what you personally bring to the presentation that no one else can or that no one else can just like you. The majority of an iceberg's mass is under water. Great presenters are the same way. The presentation they deliver only reveals a small amount of the total content he/she has about the subject. Audience members love to be understood. This begins with you understanding their needs, the amount of prior knowledge they have about your topic, what the barriers might be to them engaging, etc. You would never allow a surgeon to cut into you if he/she were not an expert with the operation room tools. The audience feels the same way about you. Know how to operate all the tools you must use during your presentation - microphone, projector, computer, props, etc. When a golfer learns how to hit a 7-iron they have learned 80% of what they need to know to hit all the other clubs in the bag (except the putter.) Your flow works the same way. It is how long you spend on one thing before moving to the next thing. Learn how to be an expert at moving the presentation along and you are 80% of the way there. Bad guys wear masks to disguise who they really are. Every presenter has enemies in masks keeping them from giving their best. Know what these are for you and work to overcome them - nerves, under-prepared, under-qualified, not an expert, sickness, etc. Just south of Half Moon Bay on the northern California coast line is an area called Mavericks. This small stretch of water creates 25+ feet waves that crazy surfers live to ride. If you can safely surf the Mavericks, everyone knows instantly you are a different (IE - insanely good) surfer. Every great presenter has at least one thing that is a difference-maker for them; something that sets them apart from other presenters. Figure out what your's is and never lose it. If you need individual or group coaching on presentations, let me know. I spend a good amount of time every year coaching people to be authentically awesome up in front.